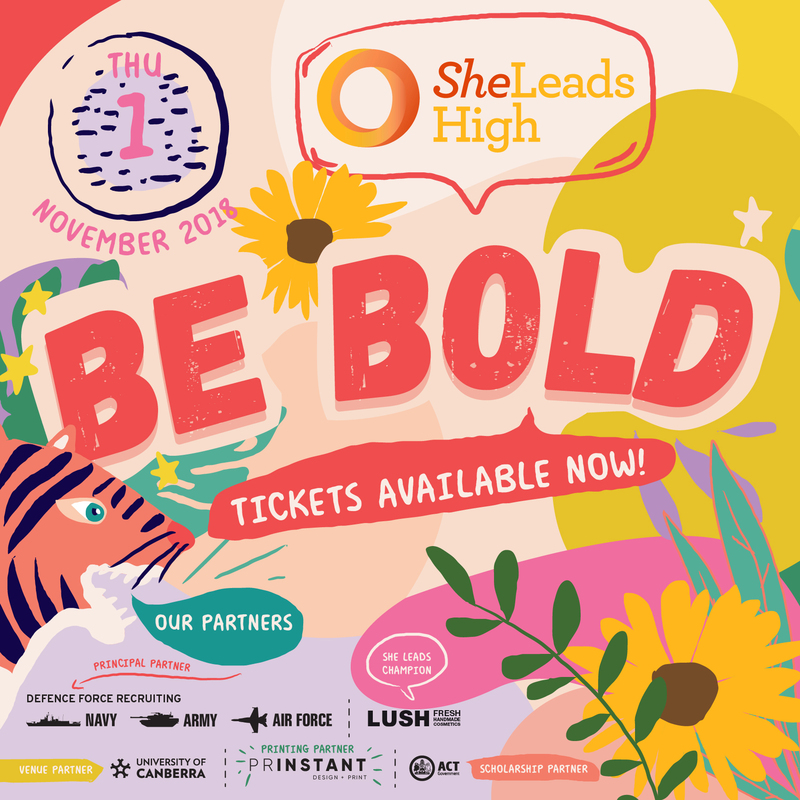 YWCA Canberra’s She Leads High Conference is a one-day leadership event for young women, including female identifying and non-binary people, in years 9 and 10. The event provides students with an understanding of the fundamentals of leadership and explores topics such as social and emotional development, peer relationships and pressures, self-esteem, and body image. Upon completion, students will be empowered to start defining and developing their leadership pathways. be empowered and inspired to set goals and develop the skills to reach them. The day will include interactive workshops, keynote speeches, and speed networking with incredible young women under the age of 25 who are leading in their communities. By encouraging girls’ attendance, you will provide them with the opportunity to develop their leadership potential, and increase their capacity to take on leadership roles within their school environment and beyond. This is a school excursion, and all students must attend with their teachers/school supervisors. The registration deadline is Friday 26 October 2018. TICKETS TO THIS EVENT ARE NOW SOLD OUT! Keep an eye out for our She Leads College Conference in 2019. This is a school excursion, and all students must attend with their teachers/school supervisors. There is a required ratio of one school supervisor to every six students. Schools must return photography consent forms to She Leads for each registered student. Transport needs to be organised independently by schools. Thanks to the generosity of the ACT Government, scholarship places for two Indigenous students are available. Please contact the She Leads team for more information, or to apply. 8:45 – 9:00 Arrivals Students will check in with YWCA Canberra staff, collect their name badges and find their seats. 9:00 – 9:30 Welcome Students will learn about what leadership is, what makes an effective leader and how leadership development can help to achieve goals. Dhani Gilbert, 2018 Young Canberra Citizen of the Year, shares her leadership journey, her academic pursuits and what motivated her to advocate for Aboriginal and Torres Strait Islander People in community work. She will discuss how at just 16 years old, she has begun carving out her leadership pathway and how other girls can also accomplish this too. Attendees are split into two groups and have the opportunity to undertake a workshop on positive relationships or developing a leadership journey. Attendees will take the alternative workshop during the afternoon session. Students will learn the value of networking while interacting with young women under 25 from the Canberra community who are leading and making real change. Students will have the opportunity to ask questions, seek advice and get inspired. 2:15 – 3:15 Workshops Attendees are split into two groups and have the opportunity to undertake a workshop on positive relationships or developing a leadership journey. Attendees will take the alternative workshop during the afternoon session. 3:15 – 3:30 Closing Remarks Event day wrap up. Vivian is passionate about promoting leadership skills and pathways for young women, especially those from a culturally and linguistically diverse background. She holds a combined Bachelor Degree of Laws (Honours) and International Relations from the Australian National University and currently works as a graduate officer at the Department of Social Services. She has developed a range of leadership skills through events management, internships, committee positions, and fundraising initiatives. Vivian is an elected committee member and Ball Director of the Social Network of Graduates and has interned at the Embassy of Ecuador in Canberra and the Australian Trade and Investment Commission in South China. Tahlia-Rose Vanissum is a proud member of the Woppaburra clan from North Keppel Island and an adviser and emerging leader who works within the Indigenous Affairs Group at the Department of the Prime Minister and Cabinet. She also works alongside local community and national organisations to help improve mental health awareness and development opportunities for Canberra Youth. Tahlia-Rose is a current YWCA Canberra Board Trainee, the Deputy Chairperson of her department’s Aboriginal and Torres Strait Islander Employee Network and a member of headspace Canberra’s Youth Reference Group. Tahlia-Rose is completing a Bachelor of Criminology at the Australian National University while finishing up her Advanced Diplomas in Management and Leadership at the Canberra Institute of Technology. It is vital that teachers attend the event and provide appropriate supervision and care and ensure that each student arrives and departs safely. It is essential that there is one school supervisor for every six students attending. YWCA Canberra staff will not provide supervision of students and will not be responsible for the arrival or departure of students, or for their behaviour on the day. Schools should treat this event as an excursion and will need to independently organise all necessary permission slips and transportation. Schools are responsible for managing the allocation of places to interested students; there are 10 available places for each school. It is important that all students want to be there. The day will feature a full program of speakers, workshops, and individual and group discussion and reflection. Students will get the most value from the day when they come prepared to engage with the topics, speakers, and fellow students. For each registered student, a photography consent form will need to be completed and returned to the She Leads team. This is not the permission slip that should be used by teachers to gain guardian permission to take students to the event. Teachers should have access to their own school-specific permission slips and use those to gain guardian permission. Please email all the photography consent forms to sheleads@ywca-canberra.org.au. Download the comprehensive Information Pack. Are you a young woman? If you are a young woman interested in attending the She Leads High Conference, you will need to let your teacher or principal know that you want to come along to the event as soon as you can. Your school may be sending other students too, or they may not yet know about this event. You will need to treat this event like any other school excursion, which means having your guardians sign your school permission slip, and organising transportation to and from the event through your school. You and your guardian will also need to complete the photography consent form, which needs to be returned to the She Leads team prior to the event. Please give the photography consent form to your teacher, who will then provide the forms to us. For further details relating to the event, or for any queries please contact the She Leads team at sheleads@ywca-canberra.org.au or call YWCA Canberra on (02) 6175 9900.